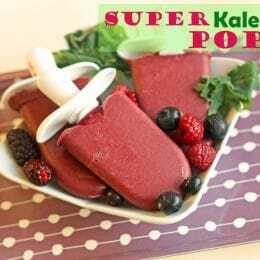 For perfect popsicles, without chunks of veggies, there is nothing like the Blendtec! And right now, you can get one for yourself at 40% off for Mother’s Day 2018! Check it out here. We make smoothies for breakfast probably 3-4 times per week. 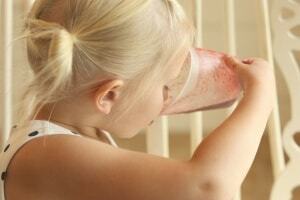 Lately I have been making a berry smoothie with kale that my kids love. The great thing about it is that you can’t taste the kale at all, there is no added sugar, and it is literally just fruits and vegetables. If you haven’t jumped on the kale bandwagon yet, no worries. 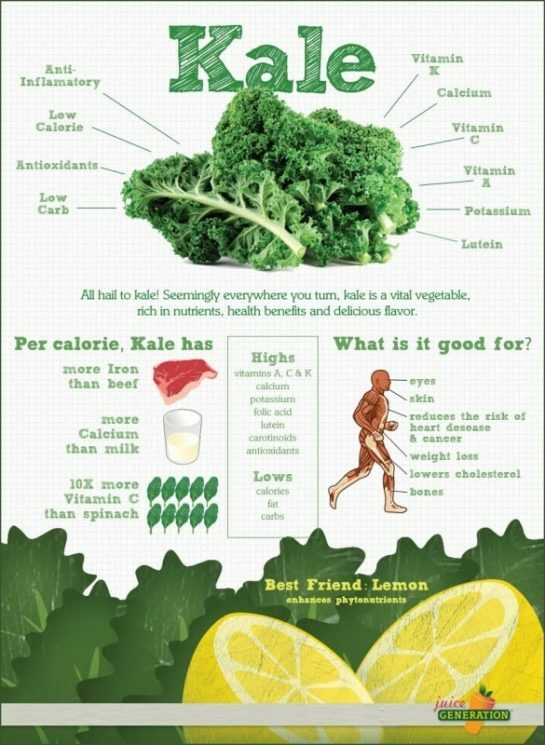 But I am including this awesome chart of all of the benefits of kale. I decided this smoothie would make a great popsicle and I was right! Since making them, both my girls have eaten at least one per day. From start to finish they take about 15 minutes to make. Are you skeptical? Are you wondering how they aren’t green at all? Well, read on and you will find out. 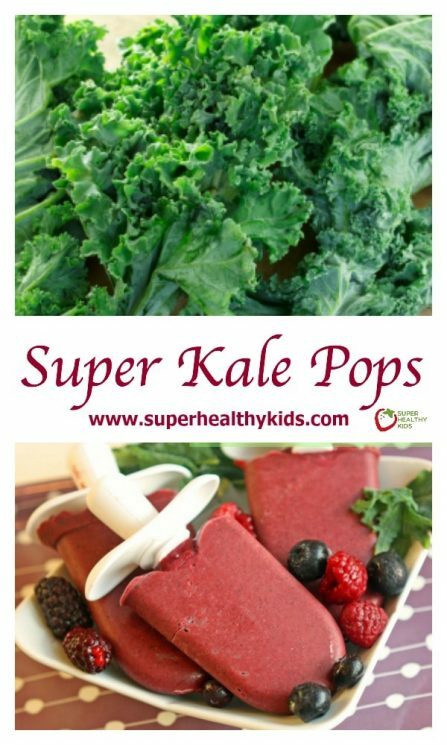 For our Super Kale Pops Recipe, all you need is these 4 ingredients and a blender. It does work best if you have a high powered blender. In fact, I would say that is the secret to these pops. Pulverizing the kale. If you don’t have a high powered blender and you are considering making a lot of smoothies, or pops, I would highly recommend investing in one. The first step is to blend the orange juice and kale together. Then add the rest and give it a blend. And what do you get? A beautiful purple/pink mixture that is sweet and delicious. No green at all. Next step, pour your mixture into your pop mold. If it seems a bit too thick, you can add a little more o.j. Don’t you love those chubby little kid hands? Oh man! Even though my 4 year old spilled everywhere – it was totally worth letting her help. She is just stinkin’ cute. 1) It makes a pop in 7 minutes. Literally to the second 7 minutes. So you can make your pops on the fly. You don’t have to wait a couple of hours and then your kids have lots interest. 2) Your pops come out looking beautiful every single time. And they have all sorts of fun contraptions to make all sorts of fun pops. Another item along with a high powered blender that every household should have. 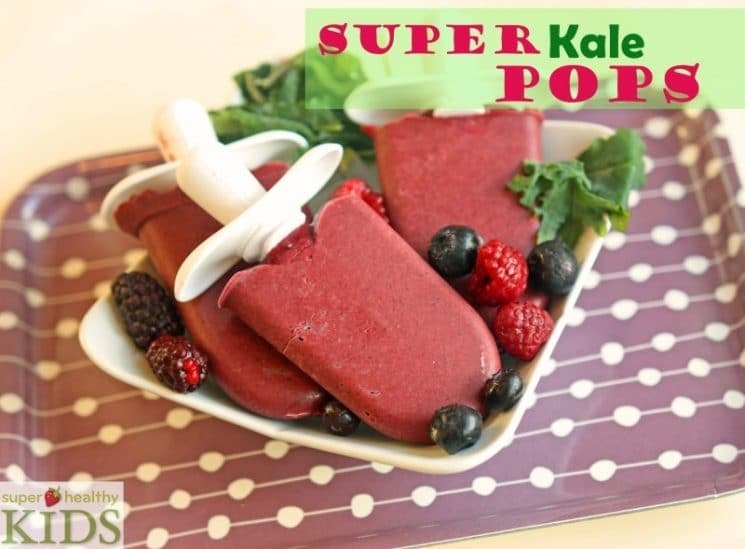 You have a healthy, low-sugar power packed pop for your kids on those hot summer afternoons. 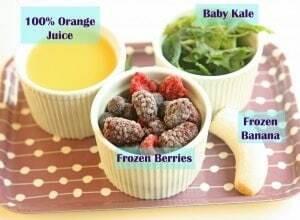 Blend orange juice and kale together until well blended. Blend rest of the ingredients until smooth. Pour into pop mold and freeze. Oh. My! These look delicious!! We use kale in one of our favorite soups, but I never know what to do with the extra. I think I’ve found my answer. I am totally printing this one off. Thanx, Natalie!! Looks so yummy and I’m going to make it tonight to see how good I can prepare it. I hope I will not change the original recipe and make it as you have told already. I wish if you could share some more sweet recipes of yours, so I can take notes and add more stuff to please my children. I’m a huge fan of home made popsicles! But seven minutes?! Looks like I need to buy the zuko! Thanks for sharing this recipe. I am really surprised that the color isn’t green. 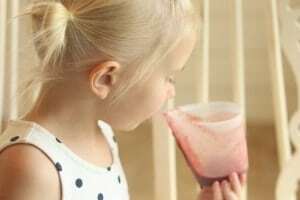 Looks quite yummy – kids prefer foods that aren’t green in color. I made it without reading the recipe. The kale didn’t really blend well so it ended up with lots of green bits. Is it because I didn’t blend the kale with orange juice first? I can’t get baby kale so get the regular ones from the market. Is that one of the reason for the bits too? There could be several reasons. The first is the type of blender that you used. 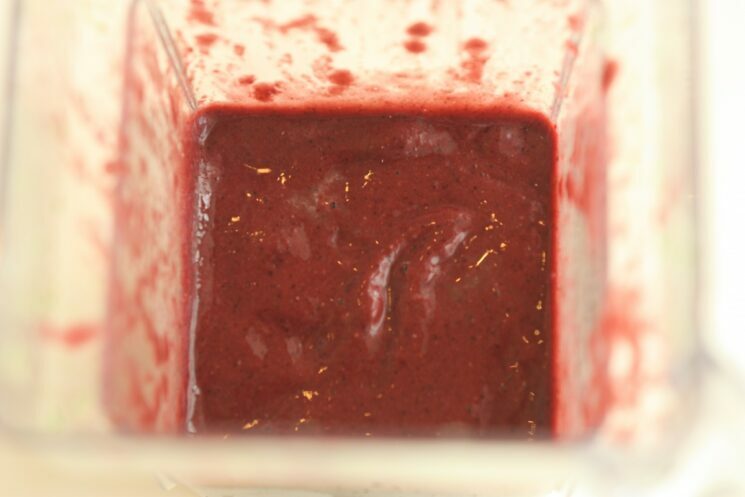 If you are not using a high powered blender, it may not pulverize the kale as small and so would leave chunks. 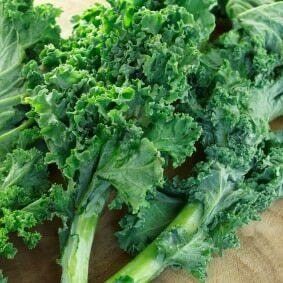 The second is that regular kale is quite a bit thicker and so you may need to blend longer. I would definitely try blending with the orange juice as long as you can to get the pieces to blend better. Good luck! What i do not understood is if truth be told how you are now not really a lot more well-preferred than you may be right now. You are very intelligent. You understand therefore significantly relating to this topic, made me personally believe it from numerous varied angles. Its like men and women are not interested unless it is something to do with Girl gaga! Your individual stuffs great. Always handle it up! It?s in reality a great and useful piece of info. I?m happy that you just shared this useful info with us. Please keep us informed like this. Thanks for sharing. Yeah, Natalie. I have the same question as that of Tina’s. 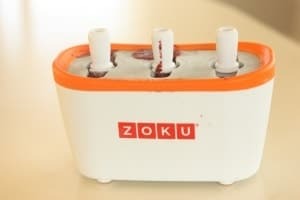 Where can I find Zoku Pops? I’ve never seen them. I live in Canada. If you look at the bottom of the post, there is a link and a picture of the Zoku maker. I purchased mine off Amazon. http://www.amazon.com/gp/product/B003U9ZCRO/ref=as_li_tf_tl?ie=UTF8&camp=1789&creative=9325&creativeASIN=B003U9ZCRO&linkCode=as2&tag=supheakid-20 You can also click on this link. You will love it! You can purchase them off Amazon! Oh wow! They’re expensive! Maybe I’ll get them when I’m no longer a poor university student, lol. Thanks! How many do these make? I have an 8 Popsicle maker, should I double it? Depends on how narrow they are Jo. I would probably leave the recipe the same, as the zoku pops are pretty wide and it just might fill up a standard 8 pop. can i make in mini zoku pops? I have had mine for 3 years with no leaking. I love it and would totally recommend! Hi Natalie! My daughter is on a citrus restriction right now, do you think these would be ok made with water instead of juice? :o( She also is on low sugar (refined, fruit ok). I’m sure they would be fine! The flavor will change a bit, but with the berries and other things I think they would still taste great! Do you know how many carbs one of these pops would have in them? I am curious because my sons both have friends who are type 1 diabetic who occasionally stay with us, and I love to healthy snacks for them and they are gluten free so I can have them. However I wonder if there is something other than banana that you could use, as I am mildly allergic to bananas? We actually don’t calculate the nutrition on our blog post recipes, but this is a great site to calculate nutrition info: http://nutritiondata.self.com/ The banana is mostly added for sweetness, and so you could substitute frozen mango instead, and it would be delicious! Good luck! 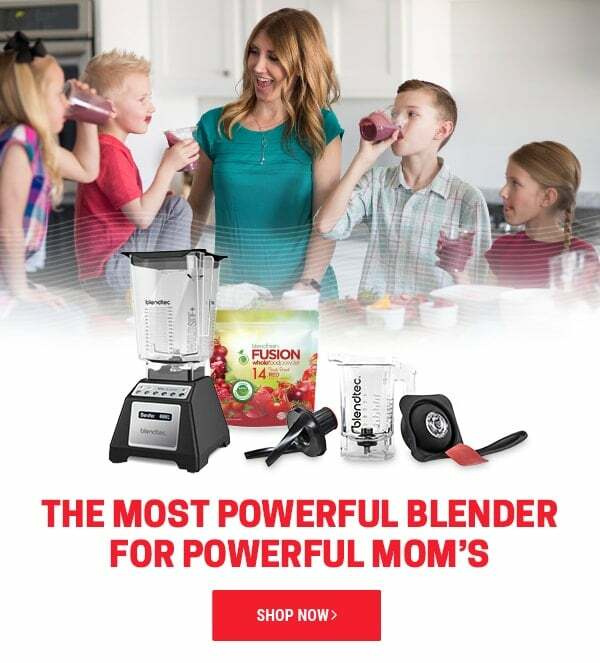 This website is a hot mess of advertisements and I had to click about 7 times before I could even find the “recipe”, and alas it was in paragraph form. I have to doubt the products being advertised.